If you didn’t install this update yet, consider to do it right now. It’s very important to defend your lovely blog as much as possible. It’s the fact that WordPress based sites are under permanent hard attacks. Just during last 10 minutes I write this post, I got 2 messages about bots trying to login into shinephp.com under ‘admin’ user. Do you still have active admin user at your blog? May be you even use some simple password for him? You are in danger. Add new user, assign him ‘Administrator’ role. Rename of block admin user immediately after that. Bad guys write special scripts, software bots which scan Internet for old, not updated WordPress installation and try to exploit known vulnerabilities. Do not become an easy victim, make your the best to defend a lot of hours you spent making your WordPress blog better. That’s cool! 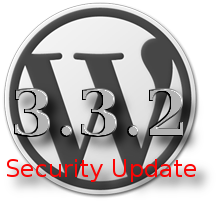 You updated your WordPress blog to the latest 3.3.2 version. This entry was posted on Sunday, April 22nd, 2012 at 00:27	and is filed under General, Security, WordPress. You can follow any responses to this entry through the RSS 2.0 feed. You can skip to the end and leave a response. Pinging is currently not allowed.